As a child, I loved reading stories from Greek and Norse mythologies. I found those more fascinating and entertaining than the fairy tales , even the gory, original versions of the popular children's tales. Between the two, I favored more the Norse myths over the Greek finding the Norse gods and goddesses more intriguing, edgy and the pantheon in which they existed more interesting. It was much easier though to find material on Greek mythology than the Norse ones. So when I came across a book titled Norse Mythology by Neil Gaiman, who is one of my favorite authors, I had to get it. As usual, Neil Gaiman does not disappoint. I was expecting something different, his own take on the pantheon of the Norse gods and goddesses. Surprisingly, he remains quite faithful to the source material without changing much of the stories. The stories will be very familiar to ones you may have read in your childhood, based on translated texts and scholarly interpretations. In a sense, Neil Gaiman is paying tribute to these ancient works and keeping the mythology alive. What he does though is subtly introduce little details and aspects in the telling of the story that makes it a very enjoyable read considering you are reading stories you are likely familiar with or read about in the past. As you read through his book, the feeling is like having an old uncle telling you a common story in his own peculiar way, injecting little bit of wit and special touches to make it more interesting and fun to read. It kept me wanting for more. Hopefully, he has plans for a volume 2. First of all, my appreciation for Mr Jojo Malig of ABS-CBN News Bureau for the valuable link to a video live stream of the Philippine-Indonesia friendly match. Since moving to Lisbon, Portugal two and a half months ago, we have to start relying on the internet to be able to watch live Philippine football matches. As for the match, there are no "ifs" and "buts" about it, Indonesia deserved their 2-0 victory against the Philippine Azkals. At first I was tempted to think that it was the quality of the video stream as our players seemed a bit sluggish, but it was very clear that the Indonesian players were quicker and livelier. They played more cohesively as well. It was typical again of our team, a game of two halves. A slow start and a more improved performance in the second half. Still, even if fortune were on our side the most we could hopefully get would have been a draw basing on the quality of our game that evening. The Azkals had difficulty creating scoring chances while the Indonesians wasted a number of theirs. It was a fair result. Anyway, this was a friendly match and the result isn't as important as the lessons and insights to be gained from the match. Let's keep that perspective and context in mind whenever we look back at this defeat. Of course not everyone will see it that way, but I am fairly hopeful that a growing number of Filipino football fans are developing a better appreciation of the sport in the sense that this defeat won't be seen as a sign that the sky is falling. So what do we get out of this match? As I mentioned at the start of the article, our players seemed sluggish, especially in the first half. The Indonesians definitely looked more sharp and energetic. With the exception of a few such as Porteria, our players seemed out of sorts. The number of misplaced passes by our team and the manner by which the Indonesians took control of the match shows that our cutting edge has dulled quite a bit. While the long ball has been an arsenal of our team, there was just one too many in this match and they looked more like wild clearances than deliberate attempts to get behind the Indonesian defensive line. Hardly any good and clear chances were created in the final third of the opposition half, especially in the first half where the lineup was filled by our seasoned veterans. I think former Azkals coach Simon McMenemy best described our team's performance: "disjointed." It certainly looked that way. Sure, it will be argued that if we had all our top players available such as Schrock, Patiño, Cagara, Juani Guirado, Jonsson and De Jong to name a few, the outcome might have been different. That is of course very possible, IF they were available. However, they weren't available and that is the reality of the game. Whether through injury, club commitment or any other reason, national teams always have to be prepared for the situation that not all key players will be available. This cannot be an excuse. Those running the team and Philippine football authorities should do all they can to ensure that there are enough quality, fit and in-form players available for call-up whenever there is a match. It's not as if there wasn't quality and experience in the team that lost to Indonesia. The starting eleven were seasoned veterans and regular fixtures in the team. While the decision of Coach Weiss to play some players out of position may have been a factor for the first goal against us, the adjustment made in the second half was more positive. Is this perhaps a question of fitness and form then? I think it was a significant factor in that match. The UFL where most of the players in the team for this match ply their trade ended its season several weeks ago while the Indonesian football league is still going on. While there may have been a few matches and training sessions here and there after the UFL season for our players, the Indonesian national team had several matches both official and friendly since the start of the year. A number of those were against top European clubs on their preseason training phase. It was apparent from this match that the Indonesians were more fit and in better playing form than our players. Considering that the Philippines will be competing in the AFC Challenge Cup and the next edition of the Suzuki Cup next year, our team and football officials should better start thinking of how to keep our players sharp and in top playing form by the start of those competitions. While the UFL has been doing a great job in providing our local based players with competitive match experience, the league is still small and there are not that many matches a season, even if we include the cup competitions. The entry of UFL clubs in the Singapore Cup and the AFC President's Cup is a good development. It will provide competitive matches for some of the players plus valuable experience against good clubs in the region. However, much more is needed to sharpen our team's cutting edge, especially for our local based players. A quick look on Wikipedia on the list of fixtures of our national team provides a very significant insight. From January to August 15 of 2013, the Azkals have played only 5 matches so far, both competitive and friendlies. Now take a look at the competitive and friendly fixtures for the same period for 2011 and 2012, it is 17 and 15 matches respectively. In 2013, the Azkals have only played a third of the matches they played in a similar period in the past 2 years. Not only that, the team played against some pretty tough teams as well in 2011-2012. I think that data is quite revealing and team officials and the PFF better take note of that fact. It is good to hear that future friendlies are being arranged and the 2nd Peace Cup will be held. I also hope that rumors of an overseas training camp become reality. 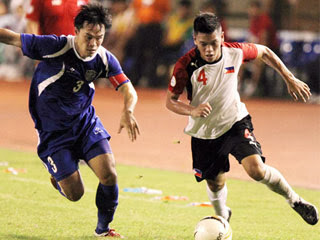 The Azkals need to regain the sharpness in their cutting edge. Sure, it may be possible in football to bludgeon your way to victory, but more often than not, precision is a more reliable approach to attaining success on the pitch. I do hope the team officials and the PFF take every opportunity to arrange matches for the Philippines. Time to get those Azkals' fangs and claws razor sharp once more. After a hard fought final against a tenacious Pasargad FC, Negros based Ceres La Salle FC clinched the PFF-SMART National Men's Club Championship with a 1-0 victory. The victory of the club from Sugarlandia was made all the more sweeter given the caliber of opponents it had to dispatch on its way to bringing the cup to Negros island. UFL Division 1 powerhouses Stallions, Global and Kaya were dispatched by Ceres enroute to the final against Pasargad. Credit should also go to Pasargad FC, who despite missing four key players in the finals still gave Ceres a really hard time. No excuses from Pasargad, who went out and gave Ceres a proper challenge for the title. Given its showing in this tournament, Pasargad is surely a team to watch out for in the UFL this season. In a news article, Ceres coach Ali Rojas Go was quoted as saying "You can win one with luck, but two, three, and four, I don’t think so. It’s all hard work.” That's right; it was very much hard work on the part of Ceres that led to their success, one that was richly deserved and unquestionable. Ceres-Negros FC right now is without doubt and certifiably thebest football club in the country. Those were all difficult matches against highly accomplished teams. Their defense needed to be steady and sure, and the offense clinical. As Coach Ali Go said, they worked really hard at it, but most of all, they believed. They believed in themselves and in one another. That they almost swept up all the individual awards (Chieffy Caligdong won the Golden Boot) showed that this was indeed a team effort. Each player supporting each other in a common effort towards a common goal. In addition to the players and the coaching staff, the other key factor in the success of Ceres FC is the overwhelming support from its management, as personified by the Yanson brothers. The significance of the support of the Yanson brothers is something that must not be overlooked. The brothers not only support the team, they are also responsible in building foundations and institutional support for the growth and competitiveness of football in Negros. This competitive atmosphere developed by the Yanson brothers and their partners in this endeavor has been crucial in ensuring that a team from Negros can go head to head and overcome the big boys of Philippine club football, particularly the heavy hitters in the UFL. Special mention also goes out to the Ceres supporters who were at Rizal. For a team based in the province, one had to appreciate the numbers and the spirit displayed by its support in Rizal Stadium. Advertisers, marketing people, sponsors, take note. It is therefore heartening to note that Ceres FC is contemplating to join the UFL. In the same news article, Coach Ali Go mentions that there is a plan to join the UFL and the soonest could possibly be the UFL Cup in the latter part of this year. However, he cautions that they need to study this carefully as there are certain challenges that need to be considered, such as logistics. This prudence is a good sign. While the entry of Ceres FC into the UFL would be a big boost for the league and support its growth, all parties must also ensure that such growth is sustainable in the long term. In much the same way the Football Alliance has carefully nurtured the growth and steady success of the UFL, Ceres FC will likewise ensure that when it throws its hat into the UFL and carry the flag for Negrense football fans, it will be there for the long term. In the meantime, let's savor and enjoy this achievement of Ceres FC. Ceres-Negros FC - 2013 National Men's Football Club Champions! Sounds sweet doesn't it? Recently resigned civil servant from the Philippine Foreign Service. Specializes in Protocol and served 3 Philippine Presidents. Assigned with her diplomat husband and son to Philippine Consulate General in Los Angeles and Philippine Embassy in Washington D.C. for 6 and a half years. I live .. I ignore warning labels. I revel in the pressure, the adrenaline.. that feeling of being on the edge and the fast pace that characterizes life.. welcome to my world! Everything posted here is a Copyright of Moira Garcia Gallaga. Travel theme. Powered by Blogger.